(Bedford Park, IL – March 5th, 2019) -- Litetronics is proud to introduce its LED Round High Bay PL fixture, a highly durable, versatile, and energy-efficient new approach to lighting a broad range of high-ceiling applications. Featuring a polycarbonate prismatic lens that distributes even illumination while minimizing glare, the new LED Round High Bay PL helps enhance visual acuity in everything from warehouse and storage settings and industrial and manufacturing facilities to sports facilities/gyms, retail centers, and other demanding applications that feature hard-to-access high ceilings and/or require powerful task lighting. Incorporating a die-cast aluminum heat sink that optimizes air flow for improved efficiency and available in 115-Watt, 175-Watt, and 240-Watt versions, Litetronics’ LED Round High Bay PL is a durable solution that delivers powerful light output ranging from 16,100 to 33,600 lumens. IP69K-rated to resist the ingress of dust, high-temperature steam, or high-pressure water, IK10-rated to withstand external mechanical impacts, and operable in extreme temperatures ranging from -10°F to 115°F, the Round High Bay PL’s robust construction ensures its endurance in some of the industry’s most challenging environments. In addition to delivering a high efficacy of 140 lumens per watt, Litetronics’ new LED Round High Bay PL can deliver further energy savings at the click of a button via a built-in passive infrared (PIR) sensor that enables users to adjust settings such as brightness, sensitivity, daylight harvesting, hold time, etc. For those applications where motion sensing or daylight harvesting are desired, users can customize settings right at ground level from the convenience of the fixture’s easy-to-use Sensor Remote Control accessory. Offering a long 100,000-hour life and an attractive 10-year warranty, Litetronics’ family of LED Round High Bay PL fixtures feature 0-10V dimming and are available in 4000K and 5000K color temperatures. The fixtures are DLC Premium-rated, ensuring their applicability for utility rebate incentives nationwide, and are additionally compatible with Litetronics’ Emergency Battery Backup unit, ensuring their operability in the event of a power failure. Fixture kits come complete with all of the necessary wiring and hooks to ensure a quick and easy installation process. One of the industry’s most trusted sources of practical lighting innovation, Litetronics has been serving commercial, institutional, industrial, and retail businesses since 1970. Manufacturing and marketing a full line of LED retrofit kits, LED high bay fixtures, and numerous other products that embody the concept of “Innovation Simplified,” energy professionals and end users alike have been benefitting from Litetronics’ high-performing, energy-saving lighting technology for nearly half a century. 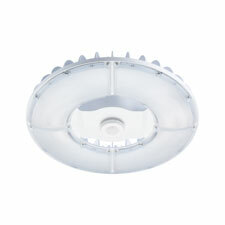 To learn more about Litetronics’ new LED Round High Bay PL fixture or any of the company’s innovative products, visit https://bit.ly/2T28utX or www.litetronics.com, contact customer service at (800) 860-3392 (toll free) or (708) 389-8000, or e-mail customerservice@litetronics.com.